I recently had the privilege to deliver the Evolution of Experience keynote at the 2018 Financial Brand Forum. For this event, I tailored the Evolution of Experience, E^3 talk tied to Empower, Exponential and Enhanced to focus on Data, Artificial Intelligence, Multi-Modal and the New 4 P’s of AI marketing, and much more. Empower is looking at how accessibility to mobile technology has led to consumers being empowered to create, amplify and influence across generations. Specifically looking at the behaviors of Gen Z and the evolving role of the camera. Exponential is all about acceleration through intelligent systems. This looks at the role of data for AI as well as the rise of virtual assistants and the ability to predict consumer needs and ultimately become a proxy for the individual that will split decision journeys between consumers and algorithms. Enhanced is all about the bridging of physical and digital and how immersive computing, AR, VR, computer vision will make the user’s camera intelligent and forever our version of reality. The talk ends with an explanation of how we will evolve from a mobile-centric world to the new normal of voice, vision and touch experiences powered by AI including a date when it will all converge as well as 4 new P’s of marketing to consider building future state strategy around. It was a good crowd and I really enjoyed the 45 minute session + Q&A. I recently had the privilege to deliver the Evolution of Experience keynote for the REX Executive Roundtable group at the San Diego Zoo. This was a lead-up event to recent IHRSA 2018 conference. For this event, I tailored the Evolution of Experience, E^3 talk tied to Empower, Exponential and Enhance to bring examples relevant for the evolution of experience in the fitness industry. Here is the full 45-minute keynote. As the experiences for SXSW 2018 begin to kickoff, one of the first stops was at the Bose Augmented Reality Audio experience. The experience starts with a video outlining various use cases tied to voice based Augmented Reality. The trick here though is that there is not a visual aspect to the experience. It’s all driven based on various inputs such as location tags, GPS and extended phone functions. By wearing the glasses, you get Audio queues such as reviews of a restaurant or landmark simply by looking at an object. The AR aspect is tied to invisible environmental queues that activate experiences. This could be an interesting bridge to full AR experiences as consumers may accept pervasive voice as an extension into enhanced reality that integrates voice, vision and touch. The form factor felt more like Snapchat Spectacles and less Google Glass. The push for form and fashion is key for mass adoption. Looking forward to the SDK this fall as my questions were less about the hardware and more about the location tagging and environmental triggers where there will be a third party dependency. On to the next experience! This post is number 500 for the BlackFin360.com/blog. Starting this blog was one of the best decisions I have made professionally. It provided me with a platform to share original thoughts, cover industry trends and serve as a repository for speaking and media coverage. It has evolved significantly from the early beginnings in 2007. The blog was originally under the domain TheBlackFin.com. Now that domain is simply a redirect to BlackFin360.com. 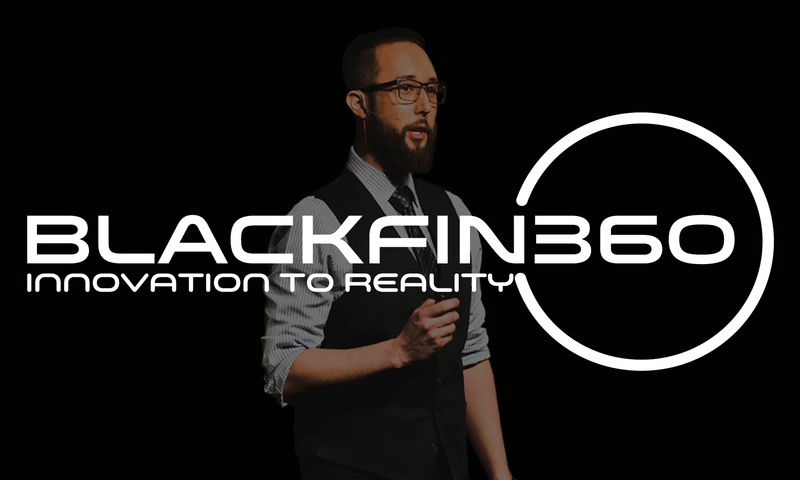 “BlackFin” was a nickname given to me by a co-worker at the time and the blog name came directly from my Xbox Gamertag “TheBlackFin“. Here is a screenshot of the original look for the blog from 2007-2009. Why green for a blog named the “black” fin is something I still wonder about to this day. Over the years the look and feel of the blog has changed but the core content focus on marketing, emerging technology, and gaming has remained to this day. I officially moved the blog from theblackfin.com to blackfin360.com in 2009. By 2011 at least there were black/techie elements in the look and feel. Now in 2018, the blog continues to serve as the primary entry point for speaking engagements, advisor opportunities, university lecturing, media coverage and over the past year it has shifted to more of a Vlog. The look of the site will continue to evolve in 2018 and beyond. Whether this is your first time here or you have been a subscriber since the beginning, I sincerely want to thank anyone who has stopped by and spent time with my content. I am incredibly grateful for this platform and I would highly recommend to anyone to find their industry voice and build their personal brand in addition to their professional. In The News: Entrepreneur.com RE: What’s Next? Entreprenuer.com & C-Suite Network recently republished my interview with Jeffrey Hayzlett discussing the balance of marketing to the needs of today with an eye towards the future and the pending impact of emerging technology. Click the image below for the full interview. Over the past six months, my team and I have evaluated the top emerging technology trends that will fundamentally reshape how marketers will connect with consumers. The full analysis includes 68 trends categorized by our trend framework of Empower, Enhance, Feel & Ambient Computing. This will replace our original framework of Connection, Cognition & Immersion. Empower to create content, engage and connect through new interfaces and touchpoints. Enhance your daily life activities and responsibilities through intelligent systems and proxy’s. Feel emotional experiences like pleasure and excitement delivered through immersive computing. Ambient computing is the alignment of all three behavioral drivers. Download the 2017 Midyear Trend Deck Today! I had the privilege to speak and host Epsilon Symposium 2017. With hundreds of clients in attendance, I was tasked with discussing the role of artificial intelligence across Epsilon and Conversant as well as tease examples of emerging technology that my team and I are working on. Here are the key highlights I discussed during Symposium 2017. Part of my role is evaluating and embracing the latest innovations and determining how they connect to our Epsilon and Conversant solutions. Whether that’s through conversational and voice based experiences such as Alexa Voice Services, Google Assistant & Siri, or the amazing artificial intelligence work happening here at Epsilon and Conversant or immersive computing such as augmented & virtual reality, that’s bolstered by our data, insights and creative execution. So the last ten years I have talked about how disruption is the new normal. How emerging technology can impact consumer behavior and what it means for marketers. Today we are at an inflection point. Where we are seeing the shift from mobile first to AI first. It’s less about disruption and more about acceleration through intelligent systems. That’s where Epsilon and Conversant’s heritage of aligning data and technology and driving innovation is the key to leveraging whatever the future may bring and where consumers will be. Within the agency business, we are using Machine Learning to categorize the data of culture along with our data of identity to fuel our creative approach. From a product perspective, We are also achieving harmony (Pun intended ;) through machine learning and AI through a centralized intelligence hub for decisioning across channels. Finally, Conversant is at the forefront of integrating AI through machine learning and image recognition to create world-class speed and scale where every 5 minutes, consumer actions across 160M individual profiles lead to over a billion model updates. Regardless of how the future state shifts and evolves… be it through bots becoming agents on our behalf, the evolution of consumer based journey’s expanding to include system based journey’s or a hyper connected augmented reality future. All of those elements will be highly dependent on Data and decisioning as the foundational element. When I think of Apple, 3 things come to mind: Industrial design of it’s hardware, interoperability across products, and of course millions of apps. After WWDC 2017, I need to add artificial intelligence (AI) enabled experiences, device level privacy and a new focus on augmented reality. AI was a the key theme of WWDC (mentioned 20 times in 2.5 hours). Apple highlighted how both machine learning and deep learning are now integrated across multiple products. From Apple Watch, Siri, facial recognition in photos and even hand written notes in iOS11. AI integrated experiences were one of the more important areas discussed during WWDC. WWDC also saw a new hardware launch in the form of the HomePod. HomePod is Apple’s entry into the Smart speaker market. While Siri is integrated into the device it’s to be determined the role it can play for brand marketers as the skills and actions we have begun to depend on in other product ecosystems was surprising absent. Apple is also investing heavily into enabling augmented reality experiences through hardware and software. With the launch of ARKit, their strategy is to empower the millions of developers to take their AR building blocks and create immersive experiences that are closely mapped to the real world via world tracking for both 2D and 3D elements. Apple is building a foundation for the future built on device level privacy, artificial intelligence, augmented reality and multimodal computing through evolving Siri beyond handsets into cars and the home with Homepod. Here is a quick reaction video following the WWDC Keynote. 2017 has seen a rapid acceleration of technology trends. Of the 50+ trends observed from CES, MWC, SXSW, F8, Google I/O and more, here are the top 5 midyear trends that I am closely monitoring heading into 2018. For the past few years, Facebook, Google and other industry heavy weights have proclaimed to be mobile first organizations. Now at the midpoint of 2017 we are seeing shifts from mobile first to AI first. Google recently announced their intent to redefine their core products around AI research, tools and applied AI. Through 2017 Machine Learning (ML) and Artificial intelligence (AI) are rapidly transforming business, products and services. A primary fuel for ML/AI is data. Understanding how to create actionable data centric AI experiences is critical to drive growth in 2017 and beyond. Conversational experiences have been a primary topic of discussion in 2017. From bots to voice based experiences, to computer vision and object recognition, expanding solutions beyond mobile and desktop has been a major trend through the first part of the year. The shift towards AI first means text and visual tied to mobile and desktop are not enough to evolve the future of interaction. As 2017 continues to unfold, we will see more voice + paired visual experiences come to market where voice is driving a visual companion experience to further enhance Alexa Skills and Google Actions. As marketers begin to shift their attention from Millennials to Gen-Z, strategies in the first half of 2017 are shifting towards leveraging the camera as a platform. From Snapchat’s ever evolving lenses to Facebook’s newly announced Frames & AR studios, major industry players are taking a core native behavior that is all about empowerment for the consumer and building new solutions that will integrate real-time data, location and object recognition to create new forms of effect based marketing. The first part of 2017 has shown the first major steps towards the rise of the proxy web. The proxy web is predicated on systems taking over core day-to-day human functions and becoming agents on our behalf. One of the big steps towards this in 2017 was the recent launch by Google of Google Lens. Google Lens combines the power of Google Assistant and provides the ability to overlay computer vision, which will serve as the basis for contextual augmented reality that links to various services, from purchasing, to content, to predictive reservations based on traffic and other environmental factors. Voice has led the way in 2017, 2018 will be the year of computer vision powered experiences. One of the drawbacks to mass adoption of virtual reality has been tied to how isolating an experience can be with limited abilities to share “what’s happening” Both Google and Facebook realize that adoption is closely to accessibility and the ability to share experiences. 2017 has seen a major shift towards the driving the democratization of virtual reality. The key to driving adoption at scale is to empower consumers, developers and other 3rd parties to create experiences. From empowering the creation of user generated 360 degree content to co-viewing, casting, capturing and sharing VR content. It’s important for brand marketers to pay attention to how consumers interact with these experiences and the rate at which they are creating their own virtual content. This week I had the opportunity to attend the Google I/O conference in Mountain View, California. It was an incredibly compelling event as Google shifted their focus as a company from mobile first to AI first. This means that all products will be redefined and enhanced through various forms of AI. This includes the Google Assistant, which was the star of the show. The deck goes into detail, but it’s incredibly important that we begin thinking about the role that the Google Assistant plays across home, smartphone, wearables, auto and soon AR. With the launch on the iPhone announced at the conference it gives Assistant 200 million voice enabled devices out of the gate. What is also key to consider is the Google Assistant equivalent of an Alexa Skill, called an Action by Google. Actions can support transactions outside of Amazon as well as not requiring installation. Also, there is a very small number of actions that exist today, but a huge and rapidly growing ecosystem of devices that are Google Assistant enabled. I was recently interviewed by eMarketer about wearables in 2017 and how they are trending for marketers as they evaluated the future forecast of wearables. The full report is available to eMarketer PRO subscribers. My summarized commentary is that most of the client demand I have experienced over the past few years has been web and mobile centric. Over the years I have focused on the intersection of wearables, and the data that’s created and how that can refine a more personalized experience. But the reality is that most wearables are simple extensions of a mobile device and that limits their value to marketers. Most of the wearable based programs I have been a part of were focused more on the data created as well as actionable notifications but interest has shifted significantly towards conversational experiences such as chatbots and voice based systems. 2017 is off to a fast start with CES 2017 as the first major tech expo of the year. Epsilon’s agency is uniquely positioned to drive growth through data driven creative and the intersection of emerging technology & consumer behavior. From a strategy & innovation lens it starts at CES. Prior to the start of the new year we published our 2017 trend framework this document sets the foundation for how we identify macro trend territories that have the highest probability of creating new behaviors and empower consumers through the lens of Connection, Cognition & Immersion in the near future. CES 2017 was our first opportunity to further validate the territories but more importantly identify some of the key tech trends that will have a major impact on marketing over the next few years. In the attached document you will find an in-depth review of key trends such as the impact a connected product ecosystem and how Alexa Voice Services are quickly positioning to scale quickly through 3rd party integrations. You will also find examples of new types of interfaces and input devices that may further lead to an ambient computing future. 2017 is also the turning point from “everything will be connected” to everything will be cognified”. The impact of artificial intelligence will be a big topic in 2017 and Epsilon is uniquely positioned to capitalize (look for more on this topic on January 19th via an industry AI op-ed). CES validated the idea of pervasive cognition as well as advancements via contextual assistants and object recognition. The rapidly developing immersion ecosystem built on full sensory immersion, spatial freedom and alternative interfaces also caught our attention. Technology is now essential to our daily lives. Accessibility and empowerment has transformed how we connect and communicate. This has led to new forms of user interaction that will usher in the business models of the future. 2017 will be comprised of new types of conversational experiences to connect with consumers. It will see the continued evolution of artificial intelligence and connected systems as well as the rapid rise of third-party ecosystems supporting virtual, augmented and mixed reality. The following trend deck outlines the evolution of marketing in 2017 through the consumer centric filters of connection, cognition and immersion and is now available for download. CONNECTION – Trends that reimagine how we connect, enable and empower consumers. COGNITION – Trends where machine based intelligence will disrupt and redefine data assets and how we work. IMMERSION – Trends that align technology and presence to evoke emotion, entertain and power commerce. ZONE OF CONVERGENCE – Trends that align elements of connection, cognition and immersion that will redefine consumer engagement. Examples include: Cars as the next Mobile Platform, Holographic Computing, Ambient Computing. How we consume and interact via digital channels is about to be absorbed and redefined. We believe that 2017 will begin the convergence of connection, cognition and immersion toward an ambient computing future built on new data types that will simplify complex tasks and predict need states vs reacting. Download the 2017 Trend Predictions Today! I had the pleasure of speaking during today’s Brand Activation Summit in NYC. I joined an esteemed panel that was comprised of a CEO, CMO and I (CDO) to discuss thriving in the age of digital disruption. It was a great discussion and a highly engaged audience. I was recently asked by Digiday about my thoughts about Virtual Reality. The pending shift towards immersive experiences is one that is exciting and presents new opportunities to connect with consumers. During my 30 minute call with the Digiday team we discussed many Virtual Reality (VR) related topics. We discussed how experiences are shifting from passive to fully interactive. We talked about the potential rise of VR commerce through solutions such as Marxent Labs approach to virtual commerce. We discussed the growing 3rd party ecosystem of providers such as VRtify, Voke and more and the role that they can potentially play with brands. We talked about Facebook’s approach to social VR and how they are currently building a team and aligning around the idea of aligning technology & presence. We also discussed the key factors that will drive consumer adoption of the technology. My opinion is that the key driver for mass adoption will be once consumers are empowered to create & share their own immersive experiences easily. The primary commentary that made it into the article is discussing the fact that brand marketers that explore Virtual Reality need to consider and validate why a consumer should engage with the experience beyond the “cool” factor of the initial engagement. I am very bullish on the potential of Virtual & Mixed Reality solutions and look forward to assisting and enabling clients to create compelling and relevant immersive experiences. Recently provided commentary to the Associated Press about how connectivity, immersive experiences and external, larger issues rather than past years, which were more about new launches. I had the pleasure of moderating a Brand Innovators Future of Consumer Experience panel discussion this morning. The panel was comprised of key execs from Southwest Airlines, Brinker International (Chili’s) and JCPenney. The topic was Customer Experience 2020: Omnichannel Retailing and Loyalty. Our discussion centered around each panelists approach to connecting with today’s consumer and how they are striving to create a return on relationships. We discussed how they see their customers behaviors changing and how they plan to remain relevant through 2020. Next we discussed what trends are on their radar and where they are spending time and dollars experimenting and working towards value creation for their brand. Some of the key trends for the Southwest Airlines team was creating seamless connections with consumers and reducing FOMO or Fear of Missing out through their approach to integrating live streamed entertainment such as live NFL games. Wade Allen, VP of Customer Engagement and Digital Innovation at Brinker talked about the role that the Internet of Things and Wearables combined with their approach to mapping data can enhance the customer experience. Tracy Chavez, Director of Advertising & Strategy/National Media Director, JCPenney outlined how they are testing Beacons as a means of creating location specific contextual connections with their consumers. We ended the discussion with each panelist giving their advice to the other brand marketers in the room about how they can incorporate aspects of their planning process into theirs in preparation for 2020. Each year I make the annual trek to SXSW Interactive. With so much content to consume, events to attend and experiential installations to see even conference veterans can get overwhelmed prioritizing where to start. One of the highlights from SXSW past is meeting a sleeping Grumpy Cat. With this in mind my team and I have created a specially curated downloadable guide of must attend talks and panels based on their relevance of topic, application to various business situations and strength of speakers. The Guide also aligns to the following five trend territories I identified for 2016. Feel free to Download and enjoy the guide! I recently attended the 2016 Mobile World Congress event in Barcelona, Spain. With over 100,000 attendees and 2,200 participating companies there was a lot of breaking news and tech on display that has the potential to reshape industries. With mobile representing a primary access point for consumers this event is becoming increasingly important for brand marketers. At the end of this post is a slideshow providing a comprehensive recap and analysis of key trends identified during the event. Here is a preview of the territories analyzed. Key Industry Topics discussed at MWC such as ad blocking, digital transformation, sponsored data and the role of 5G for connectivity in the future. Overviews of Technology that will empower consumers such as modular form factors, virtual reality cameras, connected devices and new features that can influence consumer behavior. Immersive Experiences were at the center of MWC. The recap reviews new entrants into the VR arms race, how Facebook is looking to provide VR for the masses, the role augmented reality can play for brand marketers and the potential for mixed reality. Evolution of the Connected Car dives into how connectivity is shifting from internal to external, the rise of autonomous cars, cars as the next mobile platform and the creation of immersive in-car experiences. I was recently interviewed by Terry Brock of The Business Journals. We discussed multiple topics from CES, digital tools, partnerships and my approach to digital transformation. Recently my article 9 Tech Trends Marketers Can’t Ignore in 2016 was the lead cover story for iMedia. From virtual reality and social messaging to dark data and sequential storytelling. 9 Tech trends explores key territories that will have an impact on consumer marketing in 2016 and beyond. Below is my comprehensive slideshare recap of CES 2016. There was a lot of content and interesting tech on display. I distilled it down into 6 strategic territories for your consideration that includes an overview and key takeaways for marketers. 1. The New Reality – Outlining the various virtual reality offerings presented including advancements in hardware, content creation, VR consumer services and sensors that create active VR experiences. 2. 3D Everything – A look at the advancements in 3D printing and scanning that has the potential to disrupt product prototyping as well as personalized medicine and mass customization of products. 3. Beyond Screens – This is a comprehensive look at new forms of computing and ways to connect with consumers through light, neural feedback systems and holograms. 4. Accessories that Empower – A key factor in digital growth has been the creation of systems that empower consumers to create, be it images, videos, etc. This section focuses on the next evolution of accessories that will empower the creation of immersive experiences. 5. Smarter Home – There is an arms race for to be the primary hub for the smart home. This section provides examples from Lowes, LG and others who are working to connect IoT systems and the profitable ecosystem of sensors that accompany it. 6. Intelligent Robotics – Emotive robotics and artificial intelligence will fundamentally change consumer behavior. This is a recap of intelligent robotic systems that were on display at CES 2016. I was recently asked by Venture Beat to provide insight into 5 potential technologies that I would be excited to see at CES 2016. The 2016 Consumer Electronics Show kicks off in just a few weeks, and we marketers will get a glimpse of new technologies that will impact how we talk to our audiences. Emotive robotics is based on systems and devices that can recognize, interpret, process, and simulate elements of human behavior. Last year, single function robots were hot items from the show, but with advancements in deep learning capabilities, we’re on the cusp of emotive robotics entering the home in 2016. An example of an emotive robot is Jibo, praised as the first “family robot.” Jibo and other emotive robots could aggregate Internet of Things (IOT) sensors and serve as the central nervous system of the home. Wearables of all types were crowd pleasers at the 2015 CES, but to date most wearables have primarily served as passive data collection devices. This year, the progression of gesture-based interfaces is one to watch. At CES 2015, Logbar’s Gesture control ring drew large crowds. The simplicity of Ring and its ability to interface with an IoT-powered smart home is one example of a gesture-based interface. Gesture-based interfaces could provide a fun and engaging way for marketers to connect physical and digital worlds. Interfaces like Logbar’s Ring, could allow consumer electronics companies to create customizable experiences for their customers leveraging non-touch gesture-based motions. For example, a consumer could interact with their TV, stereo, or coffee machine without ever having to touch a device. I’m looking forward to new gesture control prototypes at CES 2016 and uncovering the marketing potential for brands. Flexible displays have always held a certain sci-fi allure. Having a digital display that can be bent, rolled, and shaped into many different form factors has a lot of marketing appeal. We’re beginning to see flexible displays integrated into the Samsung Galaxy Round and LG’s G Flex smartphones and we’ve seen various standalone prototypes over the years. Thinking ahead, this type of display could revolutionize shopper marketing, as consumer brands could integrate flexible displays directly into clothing and other products, reducing consumer dependencies on mobile devices. On a recent earnings call, Facebook founder Mark Zuckerberg called Virtual Reality (VR) the next evolution of computing. We’ve seen experiential exploration of VR at past CES expos, and now we’re on the verge of VR hardware being readily available for early adopters. Recently, there’s been acceleration around enabling 360 video — a form of VR — for the masses. For example, you can now see 360 mobile video in your mobile Facebook newsfeed, and Google’s cardboard camera app supports the capture of 360-degree video and sound. Recent campaigns such as the New York Times Google Cardboard experiment and GoPro’s deep dive into 360 video are testing out new and compelling experiences for consumers. However, truly immersive VR experiences require higher-end headsets, which create a sense of total immersion. For example, companies can co-create content to embed their products in immersive experiences that align with their brand. With the Olympics coming in 2016, we can expect brands to leverage virtual reality to let consumers immerse themselves in the event. I’ll be looking for new flavors of Facebook’s Oculus experience from other VR suppliers. I’ll also be looking for systems such as Sixense’s STEM System, which provides motion controls, haptic feedback, and additional spatial awareness in VR to create a full-body controlled experience. Holographic computing, sometimes called mixed reality, is a form of augmented reality (AR) that lets users spatially interact with digital overlays (holograms) that appear in the world around them. A recent forecast from Citi analysts highlighted the future of the VR/AR industry, and their view is that AR technologies will likely disrupt major digital markets. Many organizations are exploring mixed reality solutions. One that has garnered a lot of attention is Microsoft, with its Hololens. Hololens produces interactive holograms that augment the existing physical world. The potential application for brand marketers is incredibly exciting, as AR represents a blank canvas against the physical world, giving brands an opportunity to engage with consumers in their everyday environments like at work or in the home. For example, a company could leverage AR in the home by sponsoring a grocery list, which appears on a user’s fridge and offers product recommendations when they are running out of a grocery item. The five areas I’ve highlighted here represent the progression I’m hoping to see at CES. Will they all be represented? I’m excited to find out. What marketers should be looking for on the show floor are connected devices that have the potential to drastically shift consumer behavior and the way consumers and brands interact. Shifts in entertainment greatly impact marketers, and as a result data, content, and channels will all have a new role to play. Gaining insight into the dynamic shifts in how consumers connect will be key in 2016. CES should shed light on what may be possible in the years ahead. If you happen to spot any of these items on the expo floor, tweet a pic and tag it with #CESevolved.